I was very saddened to hear of Andrew Gold's sudden death in his sleep yesterday at the age of 59. Gold was truly a musical phenomenon of the 70s and 80s, and even if his name does not sound familiar, you know his songs. His two biggest hits were the out-of-left-field 1977 psychodrama "Lonely Boy" and "Thank You For Being A Friend," the latter which went on to be the long-running theme song for the TV show "Golden Girls." While these two songs brought Gold his biggest success, they were far from his best work and don't even hint at the amazing jack-of-all-trades talent he was. Gold's initial impact came as part of Linda Ronstadt's band in the first half of the 70s, when the singer was in her heyday. He helped pioneer the Ronstadt "Southern California" sound blending rock and country by arranging many of her hits and playing a very distinct twangy guitar. Think about the solo in the middle of Ronstadt's cover of the Everly Brothers' "When Will I Be Loved" and you'll know what I mean. Here's Ronstadt performing it on "The Midnight Special" with Gold on the left behind her. His background vocals were very distinct on her recordings, and if you go through them, you'll definitely hear all those arranging, musical and vocal trademarks. When Gold stepped out on his own, it was in the era of multi-instrumentalists, where people like Todd Rundgren, Stevie Wonder and Dan Fogelberg played nearly every instrument on their albums through the process of overdubbing. Gold mastered the guitar, bass and piano for many of his solo recordings. While "Lonely Boy" (from his second album) and "Thank You For Being A Friend" (from his third album) brought him the biggest commercial success, it was his 1975 debut album that was by far his best. 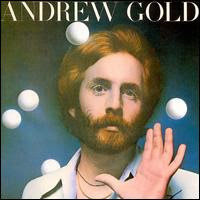 Loved by the critics and not selling many copies, Andrew Gold (cover seen above) was Southern California rock at its best, with touches of country and pop, but really the first look at his songwriting. We knew about his singing and playing, but man, this guy could write hooks the size of a skyscraper. Expert musicianship, sounding much like those distinct Ronstadt records, and lots of harmonies. Just a great album with 10 absolutely unforgettable songs. Even if the record didn't sell, at least Gold got royalties from Leo Sayer's cover of "Endless Flight." Beyond those two megahits (and writing the theme song for 90's sitcom "Mad About You"), Gold's song were not destined to last, as country/rock fell out of favor and even Ronstadt had to figure out what her next phase was going to be. Gold periodically released albums, including a mesmerizing tongue-in-cheek tribute to 60s psychedelia under pseudonym Fraternal Order of The All called Greetings From Planet Love. That album had a carbon copy Byrds song called "Somewhere In Space And Time," and nods to "Magical Mystery Tour"-era Beatles, and a John Lennon/Bob Dylan combo called "Mr. Plastic Business Man." Another side project was really something out of a pop lover's dream -- teaming with 10cc's Graham Gouldman in 1988 to form Wax UK, which had a US cult following and something more than that in Europe. They had one fantastic single, "Bridge To Your Heart," which was accompanied by a crazy Peter Gabriel-ish video. While many people will remember Gold for those two 70s hits, I will remember him for forging a unique rock sound in that era, writing many memorable songs that nobody would exactly call "easy," superb musicianship and frankly, I can't help but admire a guy who was as talented as he was. Monster Beats the Shenzhen bright direct access to the highest authorities the science and technology Limited liability company has more than 10 year Monster Beats production history, is the collection lithium ion secondary battery research and development Monster Headphones, the production, the sale in a body's Ralph Lauren Polo Shirts enterprise, lithium ion battery date productivity achieves Cheap Ralph Lauren Polo Shirts For Men, the product widely applies in motion product in and so on handset, digital camera, Moncler Jackets power source solutions. The enterprise people in charge introduced to Cheap Ralph Lauren the enterprise current production operation situation, and Polo Shirts freely about the enterprise in the electric automobile lithium battery application aspect prospects for development. Gong Jianhua introduced my city makes the Asian lithium tentative plan as Jackets For Men as the present lithium electricity Industrial base construction situation Beats Solo Hd Frequency Response, he hoped that the enterprise visits in the opportune moment to Ichun inspects, considered places Ichun the new round investment. Andrew gold was a great singer and to hear him singing with Linda Ronstadt was priceless - what a sad loss! A tradition that could cost you your salvation is the one that states that "for"(eis in Greek) in Acts 2:38 should have been translated, "because of." Let us compare "for" (eis) found in Acts 2:38 and Matthew 26:28. New American Standard Bible: Acts 2:38 Peter said to them, "Repent, and each of you be baptized in the name of Jesus Christ for the forgiveness of your sins; and you shall will receive the gift of the Holy Spirit. New American Standard Bible: Matthew 26:28 for this is My blood of the covenant, which is poured out for many for forgiveness of sins. Jesus did not shed His blood because the people already had their sins forgiven. Jesus shed His blood for (in order to) the remission of sins. Those three thousand on the Day of Pentecost were not baptized in water because their sins were already forgiven. They were baptized for (in order to) the remission of their sins. WHERE IS THE EVIDENCE THAT "EIS" SHOULD HAVE BEEN TRANSLATED "BECAUSE OF" INSTEAD OF "FOR"? How did the following translations translate "eis" in Acts 2:38? NEW KING JAMES VERSION: Acts 2:38 ......for the remission of sins.. There is no translation of the Bible that translates "eis" in Act 2:38 as "BECAUSE OF" NOR DOES "EIS" IN ACTS 2:38 MEAN "BECAUSE OF". If 'eis" in Acts 2:38 meant "because of", it would have been translated as such. The shed blood of Jesus is the reason we receive forgiveness from sins. We contact that blood after faith John 3:16-repentance Acts 2:38-confession Romans 10:9-10 and water baptism Acts 2:38. Water baptism is the point of contact. Water baptism is the last act of a sinner, it not the first act of a Christian. THE PRICE OF TRADITION IS TOO HIGH IF IT PREVENTS YOU FROM ACCEPTING THE TRUTH! Very fantastic post you have shared here keep it up. Our learning or writing skills are not only based of education its also relate to our knowledge or data that we have found in resume examples. I need your comment to improve the ringtone. Hope my ringtone collection will help you get your favorite ringtone and bring a new look to the world of ring tones. Thank you!